The ADME properties of therapeutic peptides and proteins have been improved significantly and bio-therapeutic drugs have gained importance in the treatment of critical diseases. As in small molecule drug development there is a need to understand their bio-transformations to ensure that the molecule is safe and efficacious and does not cause toxicity. The ability to find, identify and confirm catabolites as quickly as possible is critical at multiple stages of drug discovery and development. 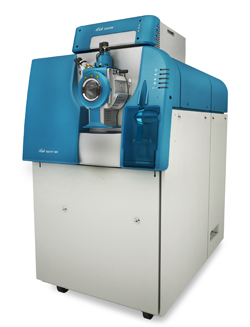 Advancements in accurate mass instrumentation such as the TripleTOF® 6600 have enabled the generation of very information rich raw data but new software to automate the catabolite identification workflow is required to benefit drug metabolism researchers. 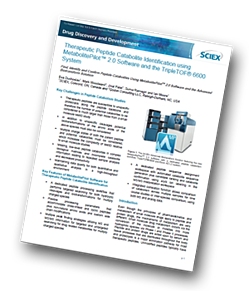 To address this need SCIEX has introduced the new MetabolitePilot™ 2.0 software that includes a dedicated peptide catabolism workflow. Figure 2 shows an overview of the data processing workflow for peptide catabolism in MetabolitePilot™ 2.0 software. The sequence of the therapeutic peptide (including any amino acid modifications and cross links) is input into the software along with an experimental reference mass spectrum. From this data a list of potential hydrolytic cleavages is generated along with a theoretical isotope pattern, charge state range and a list of product ion and neutral losses. These pieces of data are taken along with a list of potential biotransformations to form the knowledge base used for predicted and targeted metabolite searching. In addition to targeted searching generic peak finding algorithms are also used to find unexpected metabolites. Sample to control comparisons are performed to identify new species and then the MS and MS/MS information is used to generate a list catabolites. MetabolitePilot 2.0 software includes automated sequence generation for catabolites with rankings to speed up the data processing and an interpretation workspace for confirmation of the catabolite sequence using a/y/b fragment ion labelling of the MS/MS. In this tech note the in-vitro metabolism of a model therapeutic peptide Bivalirudin was investigated to highlight the new peptide catabolism workflow features of MetabolitePilot 2.0 software.